Located just 15 minutes from downtown San Diego, La Jolla, an affluent seaside community, lives up to the popular interpretation of its name as “The Jewel” of San Diego County. 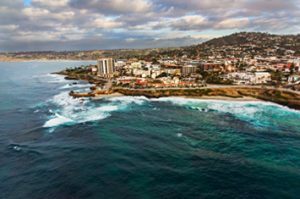 First established as a resort area in the 1890s, La Jolla’s raw natural beauty, consistently nice weather, world-class restaurants and shopping, and miles of beaches continue to draw tourists and well-heeled transplants from all over the world. La Jolla’s mild, Mediterranean climate and 300+ days of sunshine maintain an average high temperature between the mid-60s and mid-70s, with nighttime lows down in the mid 60s to the 50s. Its proximity to the ocean and natural air currents provide cool ocean breezes to moderate the hottest summer days. Not surprisingly, La Jolla’s gorgeous weather promotes an active, outdoor lifestyle, with beach activities at the forefront. As recognized by the Beach Boys in their classic hit “Surfin’ USA,” there is excellent surf literally “all over La Jolla.” From the peeling waves of the South La Jolla reefs to the gaping barrels of Black’s beach, there are challenging waves for surfers of all skill levels, with more than 20 named surf breaks dotting the coast. Even if surfing is not your thing, beachcombing, paddle boarding, fishing, kayaking, diving, and other beach and ocean activities abound. La Jolla also offers every kind of dining experience, from quaint cafes to luxurious fine dining at internationally renowned restaurants. No matter what you are in the mood for, the perfect menu is right around the corner, with many opportunities for outdoor dining with spectacular views. With its retail stores, boutiques, fine art galleries, antique shops, and specialty stores, La Jolla provides a unique shopping experience. Whether you are interested in browsing haute couture, finding the latest gadget, or finding something for that empty space on your wall, there is something for everyone. La Jolla also offers a wide range of housing solutions distributed across its many neighborhoods. Whether you are interested in a seaside cottage at Windansea, a luxurious condominium in the heart of the Village, or an elegant Murilands estate, I can help you find the right fit for your lifestyle.